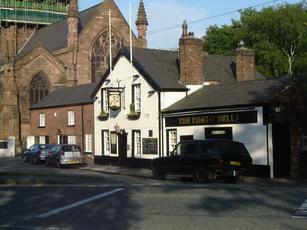 The Ring O' Bells enjoys a location next to what looks like Warrington's main church, which has an impressive, tall steeple. A wedding was in progress and half of the tables in the pub had been blocked off for guests. Ales were Coach House Bellringer & Greene King IPA. The inside has recently been refurbished and it now feels fairly uninspiring with little character. The pub was also soon overwhelmed by the wedding party. Disappointing. Went on a Saturday evening in October. Have been wanting to tick this one off for a few years and was glad to get the opportunity to do so. It was fairly busy, but we managed to get a seat in the quieter area away from the families with young children. This is a fairly unspoilt pub, plenty of traditional dark wood and old windows. The real ale choice at the time of our visit was a bit lacking - we went for a pint of Director's which was fine in itself. I think there was also another common national ale available, and a third pump which had the clip turned round. A nice pub but not much to rush back for on the ale front if you're after something a bit adventurous. New owners - reduced selection of ales - 3 on last night - Directors, some Theakston ale and another ubiquitous type who's name I cannot remember. �2.60 a pint. Live music which was OK - still doing food - busy - landlord seems like a nice bloke. Classic unspoilt pub in the coaching house style, pleasantly situated by the gate of the impressive sandstone church to the east of the town centre, in the old part of town. From the outside it looks unspoilt, with small leaded windows lit by lamps. Whilst many such pubs disappoint upon going in, the rustic nature is continued as you walk through the door, with a myriad of rooms contained under a low ceiling. Although there has been a degree of opening up, most areas feel strongly separate, with a small snug to the left as you enter, behind which is a bar room. to the right as you enter are a number of other areas, all equally pubby, with typically rustic pictures, wall-mounted seating and wood panelling. There is a food operation which is not strongly emphasised and does not compromise the overall pubby feeling of the place. The choice of beers is reasonable, with one from the local Coach House, Moorhouses Pendle Witch's Brew and Directors. Pendle Witch's was in fine condition on my visit. Overall, despite being a slight walk out of the town centre, this pub is well worth a visit, especially as it can be combined with a visit to the Tavern and Porter's Ale House, a good crawl in Warrington's flourishing real ale scene. Went in here years ago and left my beer! Now, it has been taken over by a hardworking couple and their son I think - it's been running a couple of years and although a little expensive the quality of the beer is more than good enough as is the choice. The food is said to be good too - local boozer on edge of town next to smart looking church - could do more with the outside space round back - friendly.